Currently wrapping up is SimGHOSTS 2014 USA at the American College of CHEST Physicians in Glenview Illinois, just outside of Chicago. An amazing location for innovative training — so if you are looking for a host center you should consider CHEST! 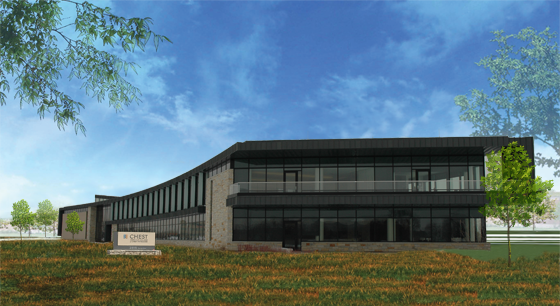 The Innovation, Simulation, and Training Center at CHEST Global Headquarters is a state-of-the art facility fully equipped to deliver clinical medical education as well as events outside the medical field. Designed and built by the American College of Chest Physicians, the training center easily accommodates any variety of meetings. Whether you want to use their cutting-edge simulation resources and high-tech audiovisual equipment or just want a comfortable gathering space, they can tailor their services to meet your needs. From the moment you and your guests step into this award-winning building, you’ll appreciate their modern style and traditional values for offering the best services for your event. Meeting management assistance: We have certified meeting professionals who can help you coordinate your event. Clinical simulation training expertise: Our simulation staff can help manage your event. The Innovation, Simulation, and Training Center and CHEST Global Headquarters boast a modern, sleek design that is welcoming and comfortable. Behind the scenes, a state-of-the-art technological infrastructure can support a wide range of technology needs. Designed to be environmentally and socially responsible, the training center and headquarters are built to Silver LEED specifications. And, in 2013, CHEST Global Headquarters won the prestigious “Green Development of the Year Award” from the Commercial Real Estate Development Association, the premier organization for real estate professionals in metropolitan Chicago. They are committed to traditional values and excellence. Their clinical education programs are internationally recognized and accredited. They hold Accreditation With Commendation from the Accreditation Council for Continuing Medical Education, placing them in the highest tier of continuing medical education providers. As the first medical association in the nation to receive accreditation from the Society for Simulation in Healthcare, they are recognized as an international leader in providing hands-on learning opportunities. View a list of their live courses, many of which are taking place at the new center. Are you looking to rent the training center space? Visit their CHEST training center website.